Erikson is a Freudian ego-psychologist. This means that he accepts Freud's ideas as basically correct, including the more debatable ideas such as the Oedipal crisis, and accepts as well the ideas about the ego that were added by other Freudians such as Freud's daughter, Anna. However, Erikson is much more society and culture-oriented than most Freudians, and he often pushes the instincts and the unconscious practically out of the picture. Perhaps because of this, Erikson is popular among Freudians and non-Freudians alike! He is most famous for his work in refining and expanding Freud's theory of stages. Development, he says, functions by the epigenetic principle. This principle says that we develop through a predetermined unfolding of our personalities in eight stages. Our progress through each stage is in part determined by our success, or lack of success, in all the previous stages. A little like the unfolding of a rose bud, each petal opens up at a certain time, in a certain order, which nature, through genetics, has determined. If we interfere in the natural order of development by pulling a petal forward prematurely or out of order, we ruin the development of the entire flower. Each stage has a certain optimal time as well. It is no use trying to rush children into adulthood, as is so common among people who are obsessed with success. You can see, for example, the damage done to many child stars by the adult demands placed upon them. Neither is it possible to slow the pace or to try to protect our children from the demands of life. There is a time for every purpose under heaven! Perhaps Erikson's greatest innovation was to postulate not five stages, as Freud had done, but eight. Erikson elaborated Freud's genital stage into adolescence plus three stages of adulthood. We certainly don't stop developing - especially psychologically - after our twelfth or thirteenth birthdays; It seems only right to extend any theory of stages to cover later development! 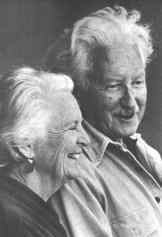 Erikson also had some things to say about the interaction of generations, which he called mutuality. Freud had made it abundantly clear that a child's parents influence his or her development dramatically. Erikson pointed out that children influence their parents' development as well. The arrival of children, for example, into a couple's life, changes that life considerably, and moves the new parents along their own developmental paths. Nothing makes you "grow up" faster than having kids of your own! It is even appropriate to add a third (and in some cases, a fourth) generation to the picture: Many of us have been influenced by our grandparents and grandchildren, and they by us. The first stage is the infant, approximately the first year or year and a half of life. The task is to develop trust without completely eliminating the capacity for mistrust. If mom and dad can give the newborn a degree of familiarity, consistency, and continuity, then the child will develop the feeling that the world - especially the social world - is a safe place to be, that people are reliable and loving. Through the parents' responses, the child also learns to trust his or her own body and the biological urges that go with it. The second stage is the toddler, from about eighteen months to three or four years old. The task is to achieve a degree of autonomy while minimizing shame and doubt. If mom and dad (and the other care-takers that often come into the picture at this point) permit the child, now a toddler, to explore and manipulate his or her environment, the child will develop a sense of autonomy (independence). The parents should not discourage the child, but neither should they push. A balance is required. People often advise new parents to be "firm but tolerant" at this stage, and the advice is good. This way, the child will develop both self-control and self-esteem. And there are other ways to lead children to shame and doubt: If you give children unrestricted freedom and no sense of limits, or if you try to help children do what they should learn to do for themselves, you will also give them the impression that they are not good for much. If you aren't patient enough to wait for your child to tie his or her shoe-laces, your child will never learn to tie them, and will assume that this is just too difficult to learn! Shame and doubt sound very negative. Do we really need them? Yes, unless you think it is a good idea to run around naked in public or jump off of buildings. Stage three is the preschooler. From three or four to five or six, the task confronting every child is to learn initiative without too much guilt. Do we really need guilt? Very much. The only people that don't feel guilt are called psychopaths. Stage four is the school-age child from about six to twelve. The task is to develop a capacity for industry while avoiding an excessive sense of inferiority. Children must "tame the imagination" and dedicate themselves to education and to learning the social skills their society requires of them. A happier thing is to develop the right balance of industry and inferiority - that is, mostly industry with just a touch of inferiority to keep us sensibly humble. Then we have the virtue called competency. The seventh stage is that of the middle adult. It is hard to pin a time to it, but it would include the period during which we are actively involved in raising children. For most people in our society, this would put it somewhere between 30 and 60. The task here is to cultivate the proper balance of generativity and stagnation. Then there is a sense of biological uselessness, as the body no longer does everything it used to. Women go through a sometimes dramatic menopause; Men often find they can no longer "rise to the occasion." Then there are the illnesses of old age, such as arthritis, diabetes, heart problems, concerns about breast and ovarian and prostrate cancers. There come fears about things that one was never afraid of before - the flu, for example, or just falling down.